Affiliates of the ILPS Philippines Chapter, including the green group Kalikasan People’s Network for the Environment (Kalikasan PNE), joined a multi-sectoral rally at the US embassy to commemorate the 1991 rejection of a US bases treaty in the country. An alliance of social and environmental activists was formed against the latest US-PH Enhanced Defense Cooperation Agreement (EDCA). They hold President Aquino accountable for the “sell-out” of national sovereignty and patrimony as the US pivots into Asia with increased military presence in pursuit of imperialist hegemony under Obama’s “long war”. 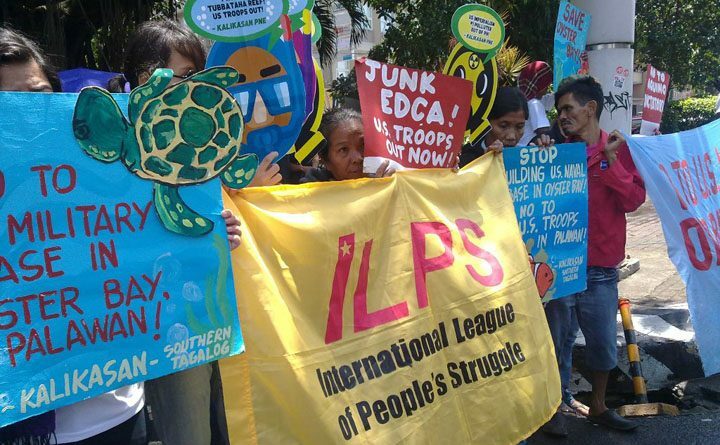 “It is ironic that Aquino will address the UN Climate Summit in New York but allow the US to trample upon our people and eco-systems,” ILPS-Phils Chair Elmer Labog said. Displacement of communities and environmental degradation has come with the increased presence of US troops. The reconstruction of the Philippine Navy base in Oyster Bay, Palawan is one of the agreed locations in the new security deal for US military use. Scores of families have already been displaced with the construction. Military exercises imposed restrictions on fishing. The site also consists of 15% of the country’s mangrove-covered forests aside from a diverse inland flora and fauna. Oyster Bay lies in a strategic location towards Spratly Islands in the West Philippine Sea (South China Sea), a disputed area rich in oil and natural gas, a major sea route in Southeast Asia and borders China’s “maritime silk road”. The US government has yet to compensate for the grounding of the US Navy minesweeper USS Guardian on the Tubbataha Reef Natural Park last year which destroyed 2,435 hectares of vital coral reefs and the dumping of four million litres of toxic and hazardous waste in Subic Bay. Aside from environmental destruction, US troops have also encouraged prostitution, violence against women, and violation of human rights.